As 2017 gives way to 2018, we reach the end of the series of Jane Austen bicentennials that began in 2011 with the 200th anniversary of the publication of Sense and Sensibility, and that culminated in 2017 with commemorations of her death on July 18, 1817. Now we remember Persuasion, Jane Austen’s final completed novel, which was published in late December 1817 (with 1818 printed on the title page), together with Northanger Abbey, an early, hitherto unpublished work. We can mark this occasion by rereading Persuasion, by considering Austen’s lasting legacy, or by exploring some of the many wonderful web resources that enhance our knowledge of Austen’s life and times. Or, we can think, as I’ve been doing, about Austen’s historical readers and the traces they left of their encounters with her writings, traces that have awaited rediscovery in libraries and archives. Here are some of those traces that most excited me. #1 and #2: Two copies of the very rare 1816 Philadelphia Emma—the first Austen novel printed in the U.S., and the only one published there during her lifetime—that were previously unknown to scholars. One was first owned by E. I. du Pont of Delaware, the other by Jeremiah Smith, a New Hampshire judge. Du Pont family papers reveal a cultured, book-loving family, in which Emma would have felt right at home. Smith’s ink annotations in his copy are a gold mine of references to Austen in periodicals of the time, including the first encyclopedia entry about her written for an American audience. #3: A very dilapidated copy of the 1816 Philadelphia Emma originally owned by a Rhode Island circulating library, penciled annotations in which had been overlooked by bibliographers. Neither of these anonymous readers seems to have enjoyed Emma, to judge by marginal comments such as “I wonder who likes this book?”. Such glimpses of everyday readers’ responses are of great value, given how little evidence had previously been found of nineteenth-century Americans’—as opposed to Britons’—reactions to Austen. #4: first owner of the copy of the 1816 Philadelphia Emma now held at Goucher College, where I teach. Lady Dalhousie, a Scotswoman, lived in what is now Canada during the 1810s–1820s, thanks to her husband’s leadership appointments in the British colonial government. A respected botanical collector, she was also, as her diaries make clear, an enthusiastic and wide-ranging reader. Her delightfully satiric watercolor images of Halifax social life convey her wit and powers of observation. #5: An 1856 travel journal kept by Anna Waterston of Boston, Massachusetts, recounting a visit she paid to Austen’s oldest surviving brother, Admiral Sir Francis W. Austen, at his home near Portsmouth. Anna’s diaries reveal that her family initially read Austen’s novels in the early 1830s, when a complete edition was first available in the U.S. Austen scholars have known that Anna’s eldest sister, Eliza Susan Quincy, wrote a fan letter in 1852 to Admiral Austen expressing the family’s great enthusiasm for Jane Austen’s writings, and requesting more information about his late sister—and an autograph. Francis, delighted by this evidence of Jane’s transatlantic renown, sent an entire letter of hers to the Quincys. What we didn’t know was that Anna spent several hours discussing Jane and her literary reputation with Francis and his family in 1856, an experience that contributed to an article on Austen she wrote for the Atlantic Monthly in 1863. Juliette Wells is the Elizabeth Conolly Todd Distinguished Professor of English at Goucher College, USA. An acclaimed speaker and writer for popular audiences, she is the author of Everybody’s Jane: Austen in the Popular Imagination (Bloomsbury Academic, 2011) and the editor of Penguin Classics’ 200th-anniversary deluxe annotated editions of Austen’s Persuasion (2017) and Emma (2015). 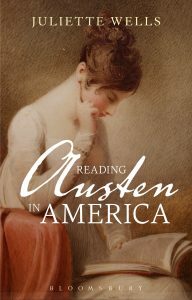 Her book Reading Austen in America is now available from Bloomsbury.